Writer-artist Andy Fish — he of the wonderful Golden Age Batman webcomic (click here) — was in San Diego this week and sent this along. He’s thoughtful like that. Dig it. — Dan. The Super7’s line of ReAction 3.75-inch figures harken back to simpler days when fun was placed over screen accuracy. Some fans don’t embrace this concept — I personally would love a Roy Scheider figure but the one from the Jaws line was so generic it was hard to justify the purchase price. But no more — these new sculpts look great! 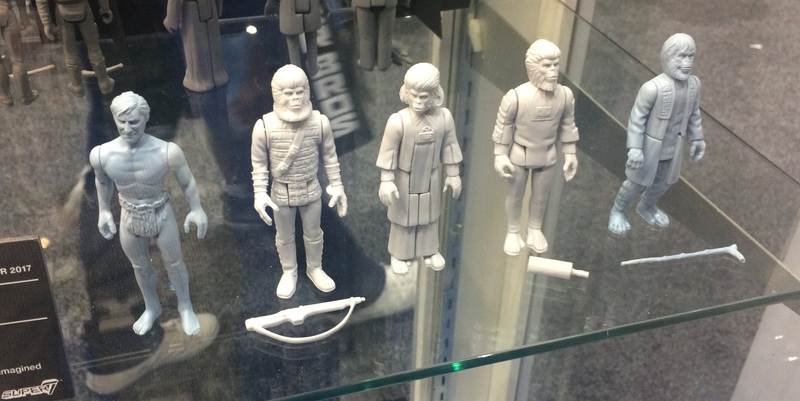 Hot on the heels of their Hellboy line is Planet of the Apes. We got a look at disassembled prototypes at Toy Fair last winter (click here) but now we get a look at the assembled figures and they look great. Zira, Cornelius, Dr Zaius, Soldier Ape, Taylor and General Urko are ready to make a madhouse out of your toybox. 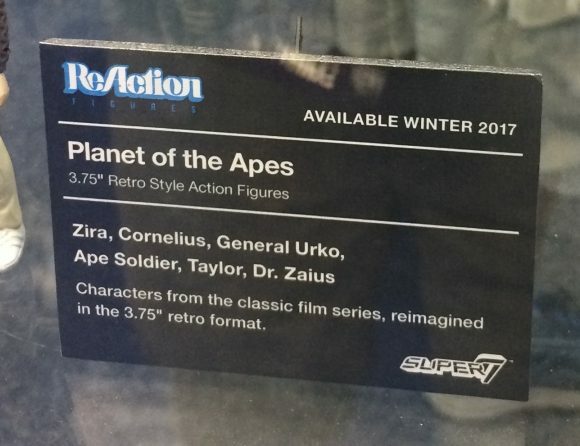 The figures are listed as having a Winter 2017 release date, so hopefully it’ll be a Monkey Christmas for fans of the classic films. They’re also continuing their Alien line with Wave 3, including “screen accurate” Ripley, Dallas, Ash (with removeable head), Brett, Parker, Lambert and Jonesy. You’ll be able to relive every frightening second of the film when this wave comes out — in the privacy of your home where no one can hear you scream. 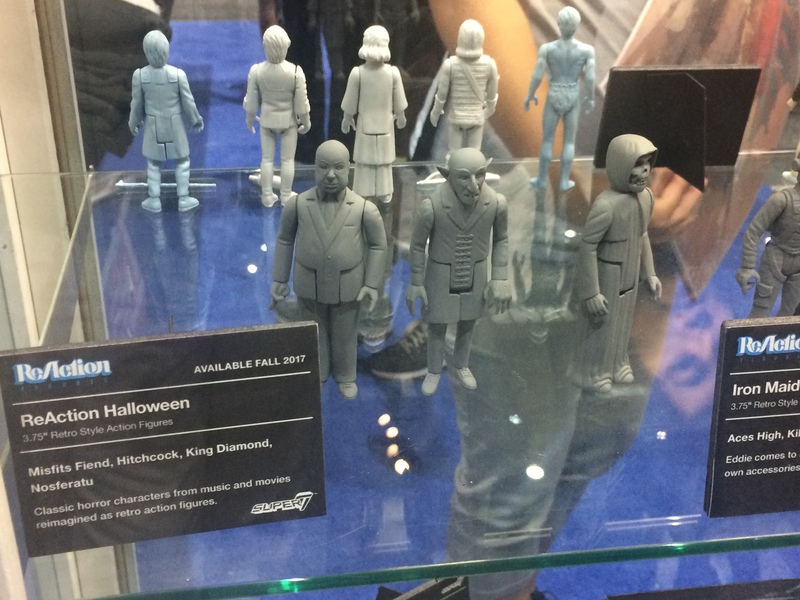 My absolute favorite though is the ReAction Halloween set, which is like a classic horror-film dream team featuring Alfred Hitchcock, Nosferatu and from 1946’s Republic serial, the title character from The Crimson Ghost — who was later used as a mascot for the Misfits. That’s how he’s being marketed here, but we all know the ghost when we see him. Super7 is also releasing variations of their The Worst line of villains, which are fun and slated to be made into an animated series I hear. The Gas Phantom is probably the best one in this line, looking like he stepped right off the cover of a vintage pulp magazine. There’s a lot to love at Super7: They’re making toys that look like you could play with them and I for one couldn’t be happier about it.